If it’s true that chefs are the rock stars of the 21st century, then Umi Atlanta‘s Executive Chef/Owner Fuyuhiko Ito is our Jimi Hendrix. His restaurant, designed by Todd Murphy, establishes an intimate mood immediately upon entry via brown walls, hardwood floors, moody lighting and subtle black and white photos from Japan. Stretching across the back of the 30′ by 30′ dining room, the sushi bar provides the primary source of lighting. A team of five chefs working in perfect synchronization looks for all the world like a band, with Chef Ito commanding center stage. Razor sharp knives (which he sharpens daily with three different grit stones), chopstick, bamboo rollers and sauce bottles are his instruments. A small charring torch provides the pyrotechnics. And Chef Ito is a master of his craft– precise and particular, his hands moving like lightning as he meticulously crafts each masterpiece. It seems somehow fitting that the logo for this modern Japanese restaurant is a simple drawing of a man playing a fish like a musical instrument. Ito (who played cello for many years) grew up in Tokyo in a house filled with music: His father was an orchestral conductor and his mother was an opera singer. But their son followed a different path, starting his restaurant career at age 17 at Tokyo’s Chateau Lion, where he handled fresh fish from the Tsukiji Fish Market daily. After working under master chef Kono in the U.S. and a top Yakitori chef at Toriyoshi in Tokyo, Ito moved to Atlanta, where he served as executive chef of MF Buckhead from 2007 to 2012. 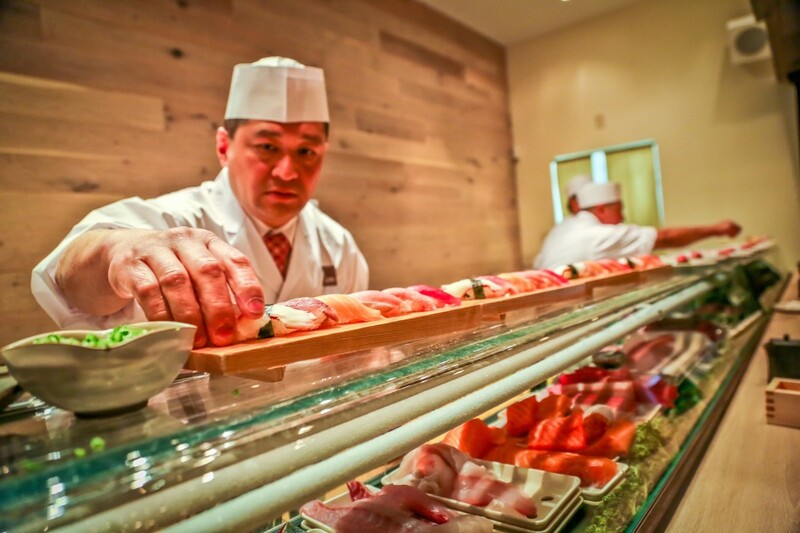 Umi, which opened in 2013, is his first endeavor as an owner. 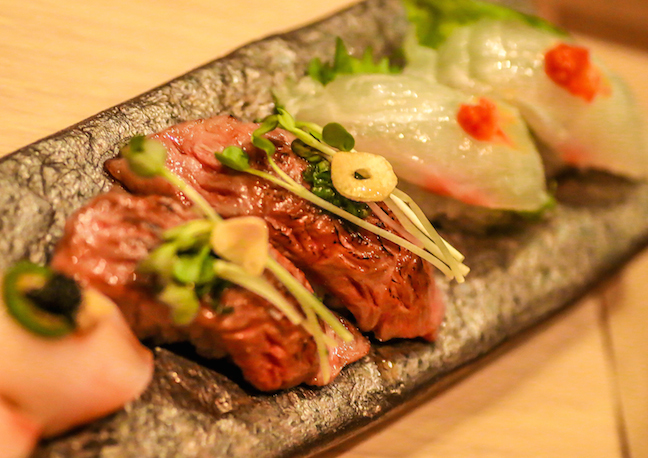 Our recent Ito-Kase tasting– our second time visiting the restaurant, but our first time sitting at the sushi bar and putting ourselves in Ito’s hands– is the closest thing I’ve ever had to sheer culinary perfection. 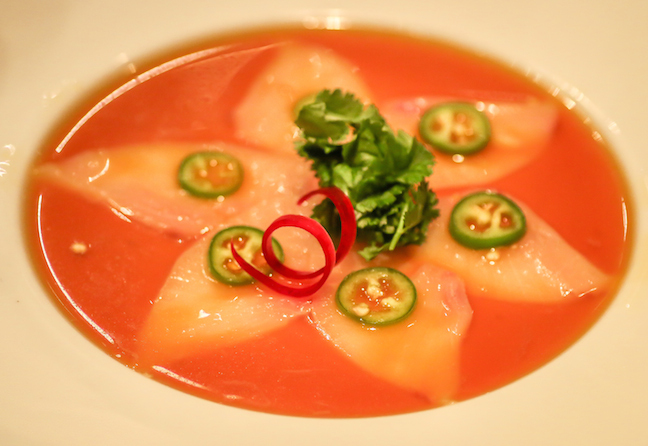 The overture began with the delicate Yellowtail Jalapeño appetizer– a colorful 6-pointed star of thinly sliced fish soaked in a homemade ponzu sauce of citrusy soy sauce and shaved bonito, then topped with crunchy sliced pepper and cilantro. It was an exquisite balance of texture and flavor. The same could be said of the Tuna Carpaccio with paper thin onion and avocado soy vinaigrette. It practically burst in our mouths with freshness, bringing back memories of sashimi eaten on an island in Panama a few hours after catching a 100-pound yellowfin tuna just off the Hannibal Shelf. 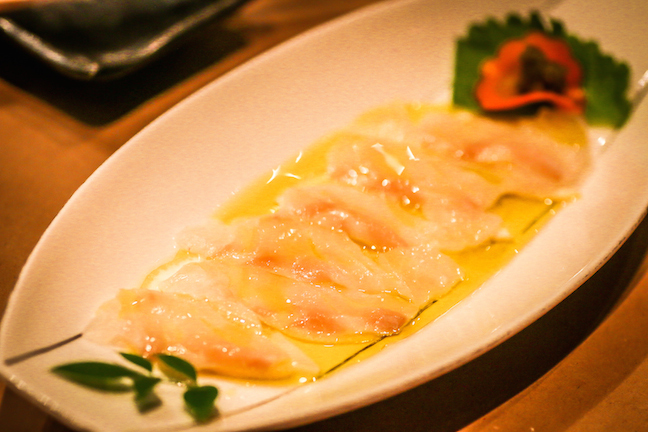 You might think that two carpaccio dishes in a row would be overkill, but you’d be wrong: Chef Ito’s Madai Carpaccio was a surprising revelation, introducing us to the mild Japanese red snapper accentuated with EVOO, sea salt, a hint of yuzukosho (a chile pepper paste) and served atop a bed of thinly sliced lemon. Clean and zesty, it proved a timely palate cleanser for the fabulous flavors soon to come. In average sushi restaurants, a sashimi platter is nothing to get excited about. But Ito’s platter was power-packed with revelatory pieces of fish that made me question the quality at my favorite neighborhood sushi joint. 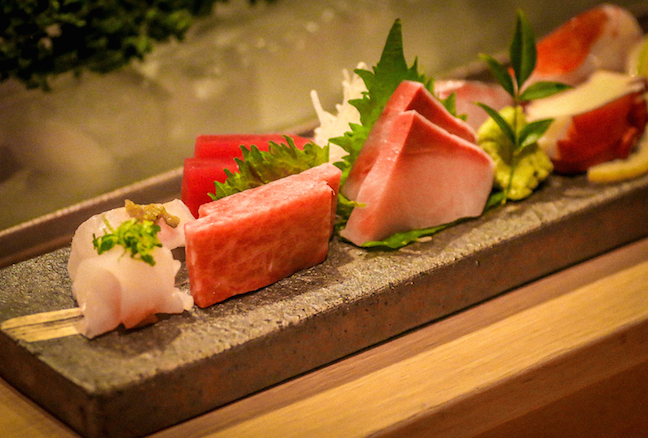 Generous cuts of Japanese Bluenose, Fatty Tuna, Sweet Shrimp, Mackerel, Scallop, Red Tuna, Octopus and Yellowtail were worth taking extra time to savor, and I found myself closing my eyes to focus on the flavor of each new bite. By the time we got to a sampling of his Sousaku Nigiri, we were in a delirious state of wanton indulgence, literally asking Chef Ito if we could camp out at his sushi bar indefinitely. From Hinomaru (Madai nigiri with shiso leaf, sea salt, kanzuri and yuzu juice) and Sake Aioli (cured Scottish salmon with garlic aioli, lime and caviar) to Kobe-Beef Nigiri (seared beef with ponzu, green onion, garlic chips and yuzu kosho) and Otoro Caviar (which made our list of the 10 Best Dishes in Atlanta), each bite was more exquisite than the last. When Chef Ito disappeared for a while, we knew he was up to something. He came back with a dish that’s not even on the menu (yet), but which totally SHOULD be: Seared Kobe Beef Tartar with plum vinegar-pickled cucumber and tomato. 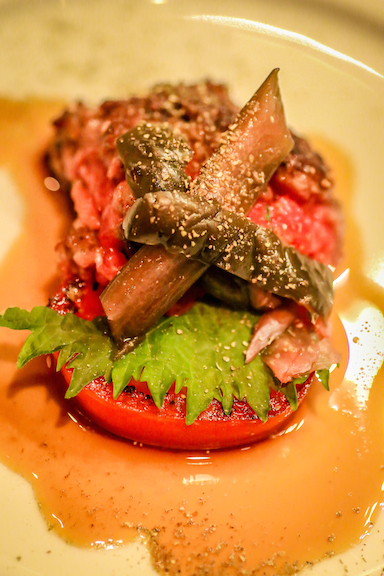 It tasted like the most impeccable, upscale Japanese hamburger you can imagine, with the tartness of the tomato and pickle cutting the fatty richness of the meat. So, so, so freakin’ good!